Rally for your favorite UAAP basketball star players as host school National University gears up for the first ever Season 81 pre-event The Last One Standing: 1-on-1 Hoop Challenge, happening on August 17 at the Mall of Asia. “We are thrilled to give our fans a jumpstart of the upcoming UAAP Season 81 as we showcase the players’ individual skills at the first ever 1-on-1 hoop challenge,” said Nilo Ocampo, President of the Board of Managing Directors of UAAP. 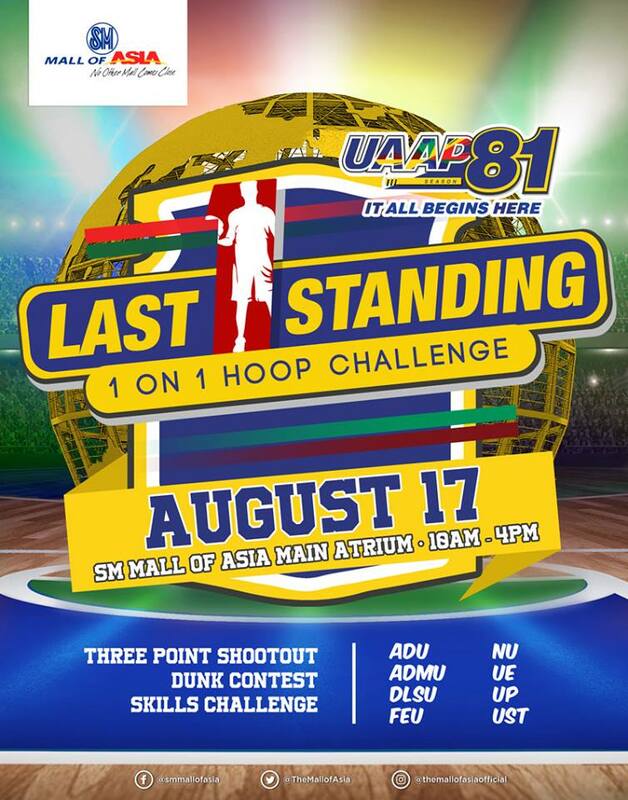 The one-day basketball tournament will pit players of participating UAAP teams against each other on a 1-on-1 basketball challenge. Aside from the tournament, there will also be a Slam Dunk Contest, a 3-point shootout and a Skills Challenge. All competitions will have a men’s and women’s division, except for the Slam Dunk Contest which is for men only. With 8 participants per division split into two groups, the tournament will have a single round robin format with the top two players of each group advancing to the semi- finals. The last two players standing will play in the finals. Winners will get up to Php 20,000 worth of products and gift certificates from SM Supermalls! Don’t miss out on other fun activities this season! Show off school spirit at the UAAP Season 81 opening at the MOA Arena with special performances from James Reid, Spongecola, and surprise foreign artists!